If you’re wondering if it’s possible to make money at home with Amazon, the answer is “yes!” It’s 100% within your grasp to find a work at home job with Amazon with ease! In fact there are many different ways you can make money from home with Amazon. Amazon is one of the biggest online retailers there is. It literally dominates its competition day in and day out. Thankfully, Amazon is with the times and realizes that there is a way to have workforce options at home for people to make money at home with Amazon. The good news? This offers people all over the world the chance to earn money from the comfort of their own home! If you’re wondering how to make this online option happen for you, you can read all about the Amazon Sellers Central Program here that offers people one of many ways to make money at home with Amazon! While there can be a variety of ways to make money with Amazon, one of the most popular ways is to sign up and be part of their Amazon Sellers Central Program. Millions of people around the world are part of this work at home platform and have found great success in using it. In fact, some businesses claim that over 40% of their revenue is generated this way! Why make money at home with Amazon Sellers Central Program? There are literally a ton of options with it comes to choosing a category or product to sell. Plus you can choose between two selling options (professional or individual) and have a low monthly or per product fee to pay. Registration is simple and only takes a few moments to get signed up for the Amazon Sellers Central Program. It’s seriously as simple as that. If you signed up for a professional account, you can upload items and information easily in bulk. However, if you signed up as an individual, you’ll need to be uploading each and every item one by one. You can list items that Amazon already has listed to sell or you can list items that you’re going to be selling but isn’t yet available yet on Amazon by entering in their UPC/bar code. And literally, that’s the steps. What are the benefits to selling your items on Amazon? Your products will be seen by millions of people. As opposed to selling items on your own website, Amazon already has a customer base and it allows your products to receive more visibility. Amazon can handle customer service, fulfillment, and shipping on your items saving you and your business a lot of time. You can also choose to do the shipping and fulfillment on your own if you would like. Some people prefer this especially if they are selling only occasionally. I sell all my homeschool books I used throughout the year at the end of each school year. The rest of the year I don’t sell much on Amazon so I just use an individual account and have the fees associated with that. I also ship and fulfill the items myself. Some people only sell around the holidays to make some extra cash selling toys and gifts they find at a good price. These people would probably also use an individual account and fulfill the items themselves. If you are a business owner that sells products year round and are using Amazon to expand your business then you will want to sign up for a professional account and then decide if you will want to take care of shipping and fulfillment yourself or use fulfillment by Amazon. To find out more about Fulfillment By Amazon (FBA) visit our post Make Money With Amazon . 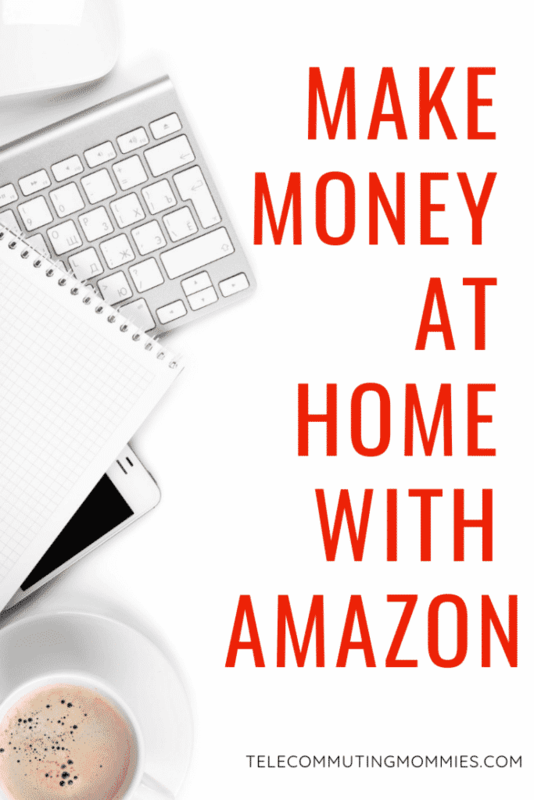 It’s so simple to make money at home with Amazon! And while it can be quite simple, there are a few things to keep in mind as well. Competition can be fierce when selling on Amazon so understand that it takes time and effort to build up a strong reputation in the online selling world. However, once you get there, you can be certain that selling on the Amazon Sellers Central Program platform can be a super simple passive income. Not only does Amazon notify you when a purchase and payment are made, but they fill the product and ship it from their own warehouse as well. This may be one of the most hands-off and simple ways to make money at home with Amazon. Before you get started, make certain to educate yourself and read all the fine print associated with selling with Amazon. You don’t want to take the risk of your account being suspended or terminated because you didn’t follow their rules for selling. It’s entirely possible for you to create a “store” from your own home where you can make money by selling items and products on Amazon!